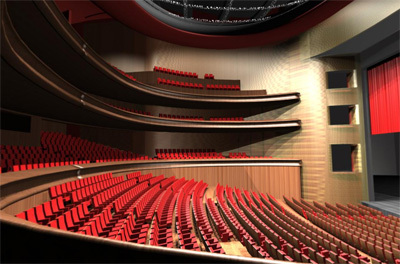 Opera houses, concert halls, and theaters are architectural monuments to a rich culture of performance arts. Traditionally performance environments have been done in warm palettes: red specifically but with lots of gold, orange and warm woods and stone. Its a color scheme usually called "Red Plush." For example, below is the newly reopened Bolshoi Theatre in Russia. 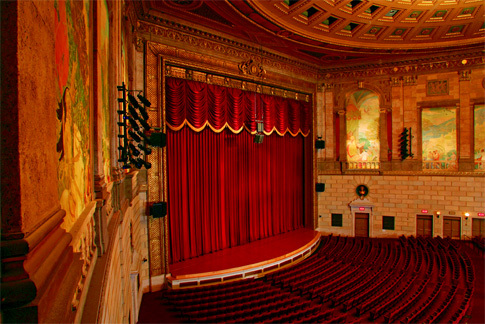 Eastman Theater in Rochester, New York is also a classic example of the red plush grande drape and seating upholstery. The meme has spread all over the world. Above is Chinas National Centre for the Performing Arts in Beijing. It is truly epic inside. 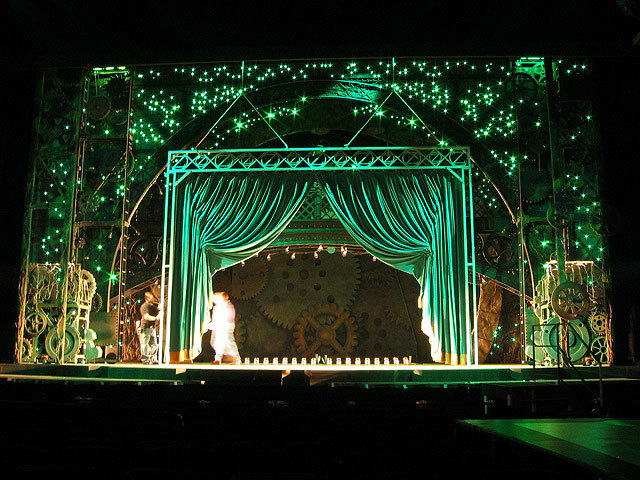 Our Associate Designer, Emily, can tell you from personal experience, when you stand on that stage the audience is an expansive sea of lush red seats. It goes back and back and back for what seems like forever. 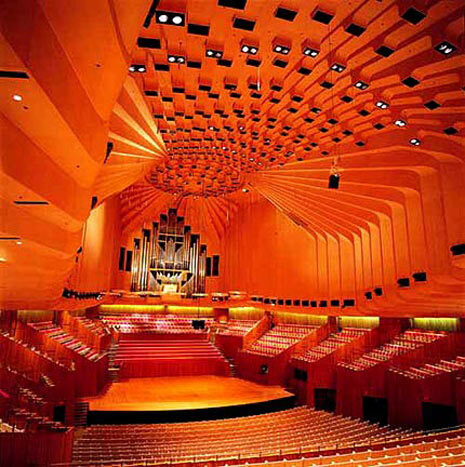 The Opera house alone seats 2,416. Though we have found very little direct evidence about why red plush came to be the dominate scheme or why it continues to be, there are a myriad of different opinions out there. The psychological profile of red associates the color with power, anger, blood, all things dramatic and dynamic. Red dyes were particularly difficult to produce during theater's renaissance revival. The dyes were very expensive and were perceived as opulent, extravagant, special. Those lucky enough to afford tickets to attend theater expect the experience to be stimulating and engaging which fits with red's personality. For the more scientifically minded of you there is the theory about the shorter wavelength of red allowing the eye to easily adjust to a darkened environment. For more theories see this. 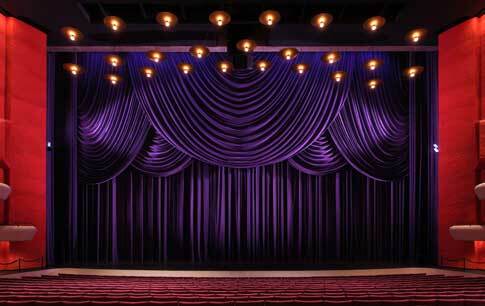 But as we were looking around for images of theater interiors we came across an outlier or two. Above the Indiana University Musical arts center trades in the red grande drape for a perhaps even more opulent royal purple. This one is cheating a bit, we admit it, but this emerald green drape from Wicked would be lush and vibrant as a grand drape. However the color message would be entirely different. Mystery awaits in the forest. What colors would you like to see on your next trip to the Opera or Ballet? the San Francisco Opera House has a gold stage curtain. But I've always thought it would be fabulous to see a pale blue velvet curtain, to match the wonderful color on the ceiling. These photos are so beautiful.. they make me wonder how anyone could not love going to the theater if for nothing else than the eye candy!